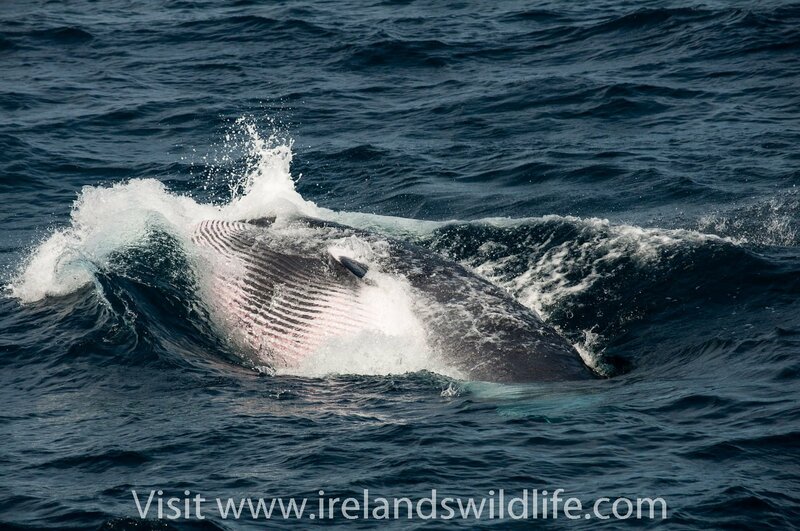 You are here: Home / Featured / Minke whale extravaganza: amazing whale watching in West Cork! I’ve been lucky enough to do quite a lot of whale watching in my time — in some of the world’s iconic whale watching hotspots. But last weekend West Cork, off the south coast of Ireland, reminded me once again that I live in a place that, on its day, can rival the best whale watching anywhere in the world. 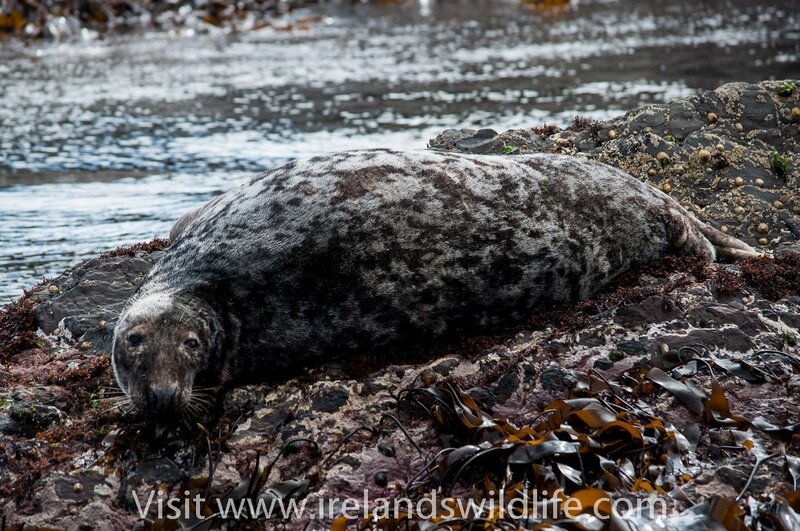 A grey seal lounging off the rocks off The Stags, West Cork. I’d heard through the grapevine that there was some astonishing minke whale activity just off the coast. Circumstances dovetailed nicely for once, and I ended up joining Colin Barnes of Cork Whale Watch for his afternoon trip on Saturday 10 August. As the MV Holly Jo slipped out of Reen Pier, near Union Hall, anticipation aboard was palpable. It always is at the start of a whale watching expedition. Nobody quite knows what to expect, and no two trips are ever the same. Some great views of the Atlantic grey seals lounging on The Stags got things off to a flying start… but it was the minke whales everyone wanted to see. Clouds of diving gannets were the first clue that we were in luck. As we approached the gannets and flocks of manx, sooty and the occasional great shearwater, we saw common dolphins surfacing beneath. Then the first minke whales appeared, lunging explosively through the tightly packed shoal of young herring with astonishing power. 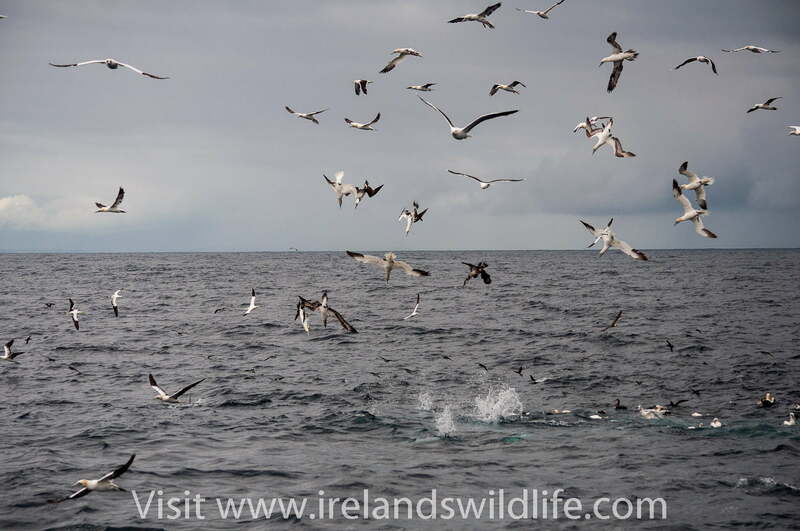 Gannets dive into a shoal of juvenile herring driven to the surface by feeding common dolphins and minke whales. I’ve seen minke whales before… but the usual view of this, our smallest baleen whale, is an all too brief glimpse of a rolling grey-black back and small dorsal fin as the animal surfaces. To witness them lunge feeding like their larger cousins, the fin whales that visit Irish coasts in autumn and early winter, was truly remarkable. We were treated to an incredible display as up to eight minke whales (best estimate under the circumstances) a large number of common dolphins and staggering numbers of seabirds took advantage of fishy bounty. It was an amazing wildlife experience — up there with some of the best wildlife encounters I’ve ever had, anywhere, and something I’ll remember for a very long time. It’s hard to capture the experience in photos or on video… but this short clip shot on a mobile phone from the boat gives some sense of the bird activity at least — with some whales and dolphins visible too. On the way back to port we were treated to some fantastic views of bow-riding common dolphins right under the bow of the Holly Jo — a magical end to a fantastic afternoon on the water.